So, now that we’ve figured out what we’re doing with the front yard, it’s time to tackle the backyard (where we spend most of our time during the summer months). With 4 active teenagers and 2 hyper dogs, we need a space that’s family-friendly and fun for all ages. The foundation around our garage is always damp from water run-off. We have a small slope, but it’s enough of an incline to create problems. The siding and roof of our garage will eventually need to be replaced (if not the whole darn thing), but for now…a strip of stone will surely help. 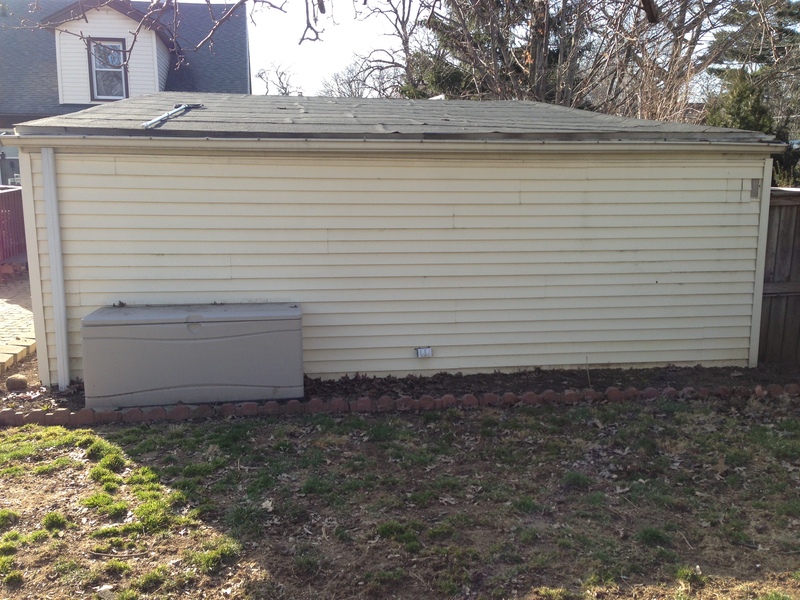 These photos are of the back and side of the garage (taken earlier this month)- we would need to add some soil so that we angle the dirt away from the garage.. Then we’ll pour in some stone and install basic plastic edging along the outer edge to keep everything in place. It would something like this once we were finished (photo from Country Woman Magazine)- a huge improvement from the mud that’s there now! 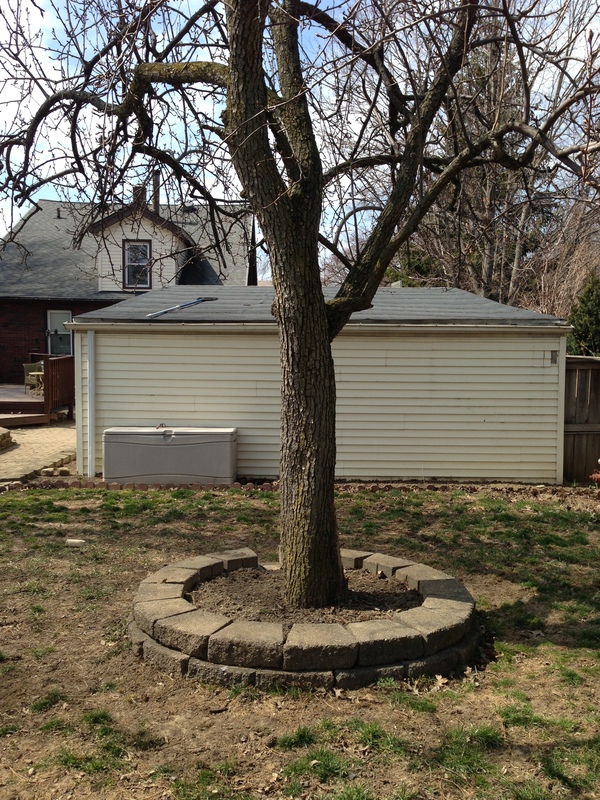 We already have a small round tree planter around our pear tree, but the idea would be to expand it along the side of the firepit (another future project). Obviously, the firepit project would be done first…then the tree planter. For now, what we have is good enough. 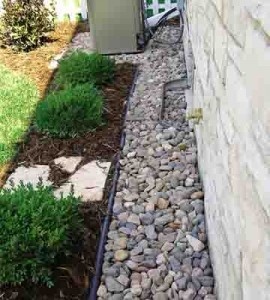 We just need to clean it up a bit and add some shade-loving perennials, or a slow growing ground cover maybe. 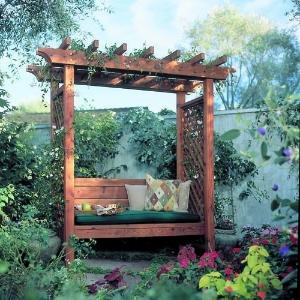 I’d also like to see a nice shaded bench area, perhaps centered along the back fence…maybe with a pergola like this one from sunset.com? 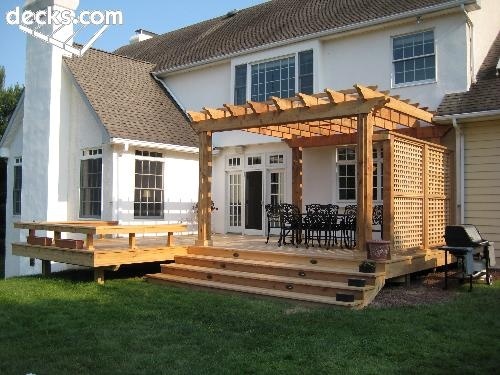 The pergola would serve double-duty by giving us some added privacy and creating nice shade. Thankfully my husband is pretty handy so, he’s agreed to build a small potting shed to give me a space for my gardening gear and what not. It would be small, like 6′ by 8′, but it would help me to organize everything in a place that’s out of the way. 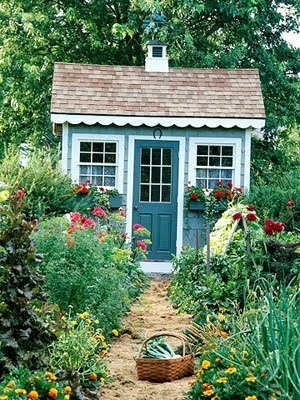 An adorable cottage shed, like the one above from BHG, would fit nicely in our small back yard and would look perfect tucked away in a quiet corner. 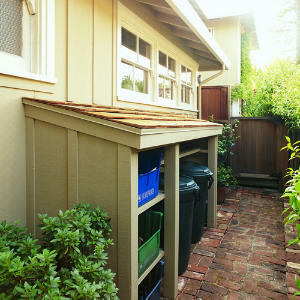 I’d also like to incorporate a compost bin in the same area, so that it would be hidden away but easily accessible. We talked about removing the above ground pool and adding a firepit, but I don’t know if that’s going to happen this year. Eventually, we’d like a firepit area like the one below (photo pulled from Pinterest). 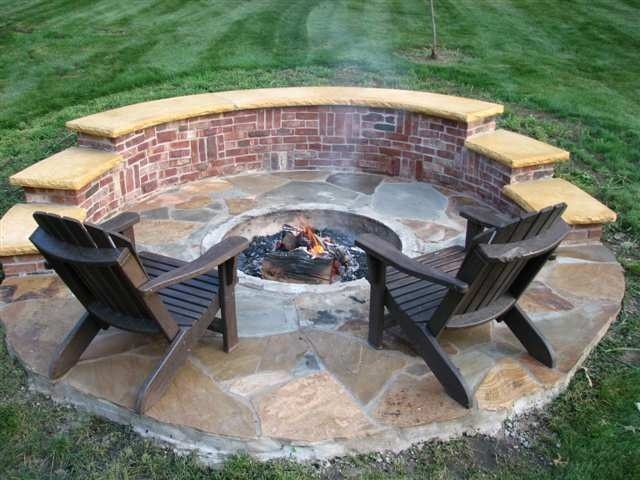 Ideally, we’d want a firepit with a small retaining wall- the wall would work great in our slightly sloped backyard and it would give some extra seating. We’d also like to rip out the large garden area where the pond is located. We tried to bring it back to it’s former glory, but as it turns out…it can be time consuming to maintain. Plus, the dogs drink the pond water (yuck) and rip up any new plant I put in. Hense why it looks the way it does. 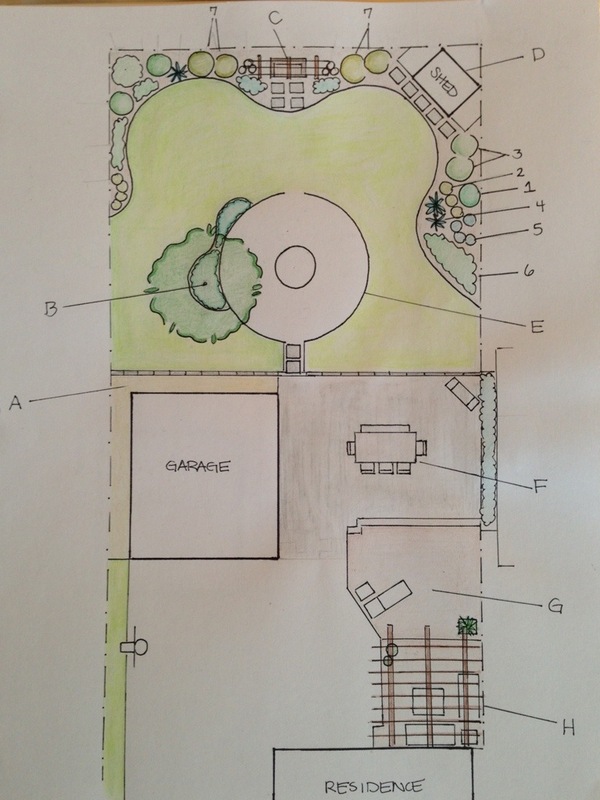 Instead of a garden, we’d like to extend the existing brick pavers to create a patio area for the dining table. The patio would be an extension of the deck. 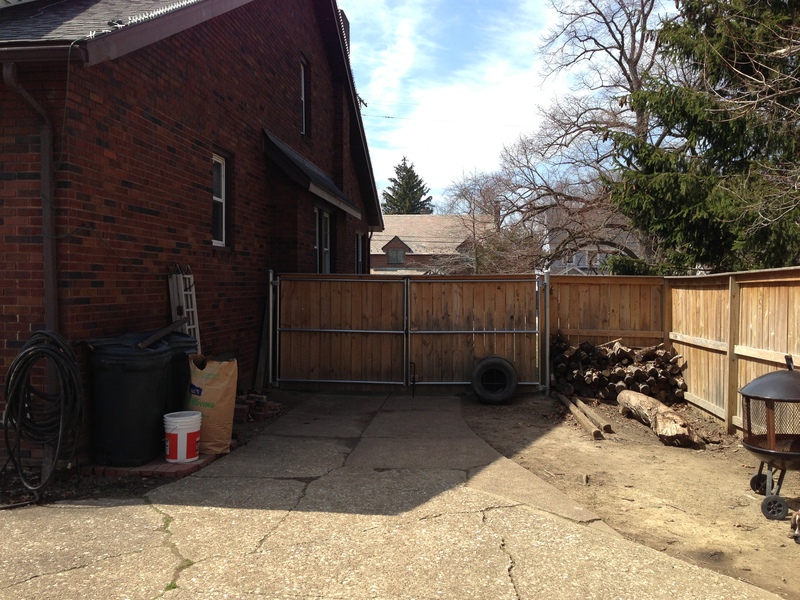 Aside from these improvements, we also need to figure out what we’re doing with the area around the driveway gate. 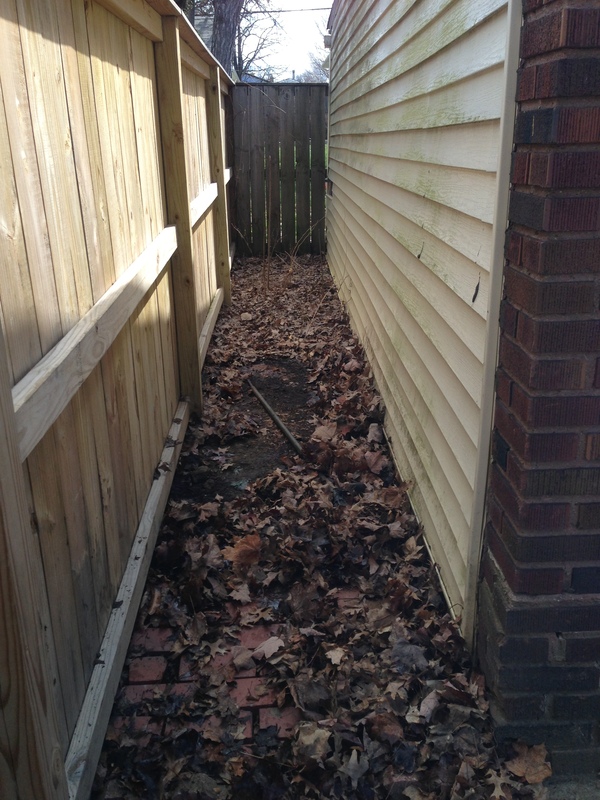 Since we’re planning to eventually widen the driveway to reach the house, we’d have to put it on the adjacent corner…. We’d just have to move the rose bush, but otherwise it would work well. Not sure if the kids would have a problem with it being too close to their basketball area, though. 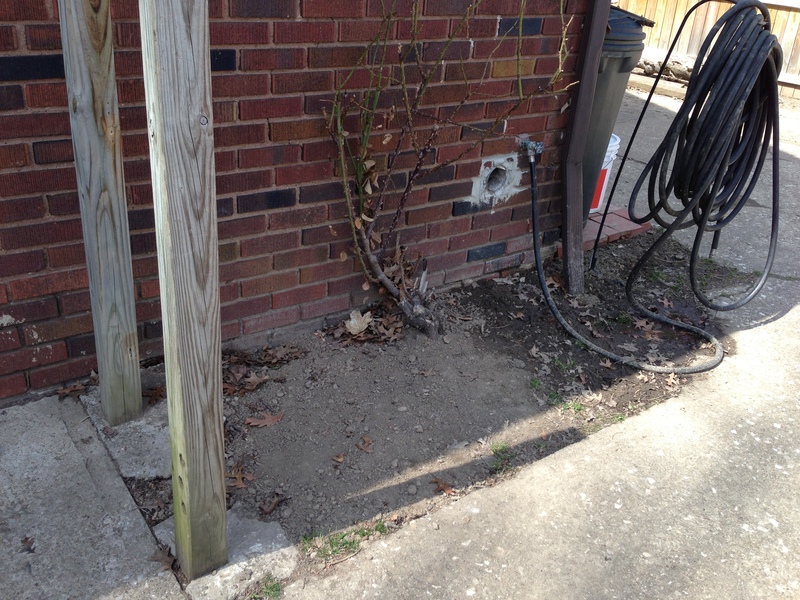 FYI, the wooden posts are from the old fence (we never got around to removing them).